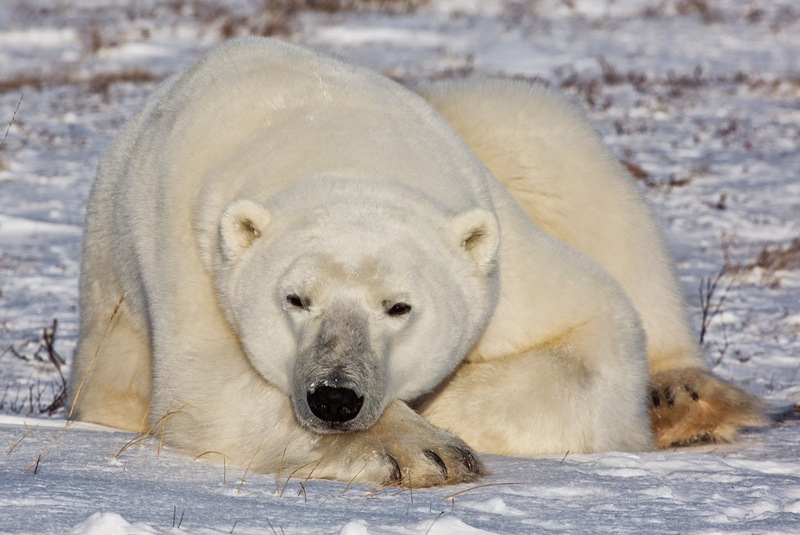 Depressingly, many areas of polar bear tourism rely on human food sources. Arviat, north of Churchill, is a traditional hunting community with an active garbage dump and game is stored in town. A controversial experiment is underway to bait bears with seal meat outside town as a diversionary tactic. The town isn’t yet established as a tourist destination, but it’s becoming more common for professional film crews to visit it. 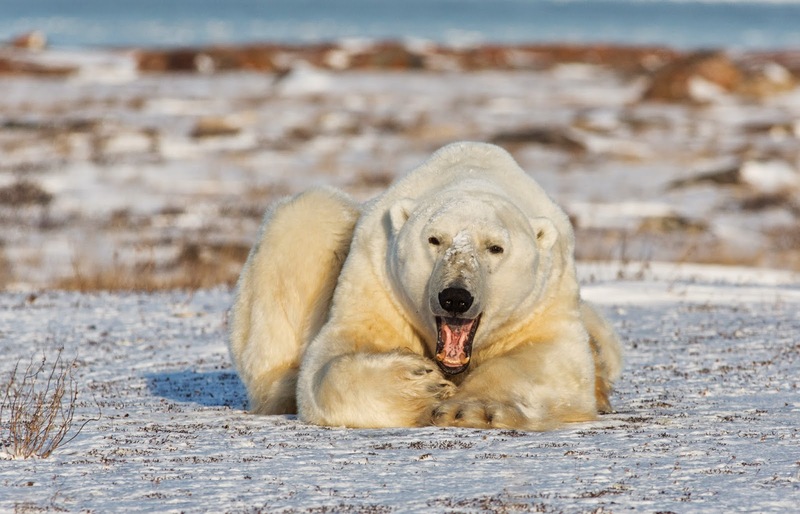 Meanwhile, in Alaska's high Arctic, Kaktovik’s profile is increasing as an area to observe polar bears feeding on whale carcasses dumped during the hunting season. Churchill has seen some progress in management of human and bear interaction. Polar Bear Jail opened in 1980, where bears which have come into contact with people are held for unto 30 days without food before being transferred north by helicopter. Access to the town’s old dump, which became an uncontrolled tourist destination during 2011, has now been blocked off. Manitoba Conservation patrol the area around town, scaring off bears which wander into the area before they come into contact with people. However, controversy remains around the charismatic local Brian Ladoon, who keeps sled dogs on his land adjacent to the coast. I found that this is one of the places where bear encounters were most common this year. Allegations have been made that they have been attracted to a human (or canine) food source. I found no evidence of the baiting of bears, but suggestions of a conflict of interest arise from his decision to charge visitors to view the bears. Ladoon claims that this provides a seasonal income to support his dogs on a non-profit basis, and it cannot be denied that life in the far north is tough economically as well as physically. Yet, feeing bears is illegal, and the temptation to manufacture a tourist attraction through unethical practices is strong. Some will feel that my desire to investigate further this year, after my first encounter in 2010, is in itself wrong, but I hope to draw greater attention to the situation. The welfare of his dogs has attracted criticism from PETA, and there's a description of their unnatural interaction with bears here. On my visit, bears and dogs appeared largely indifferent to each other, and the two large male bears around his land were largely placid. It is clear that it has become a popular destination for visitors, with several tour buses and private individuals visiting, as well as a film crew. Manitoba Conservation has previously taken an interest, and last year removed a number of bears from Ladoon’s land to polar bear jail. I would suggest that despite their detractors, the tundra buggies represent a far preferable form of regulated tourism, though the funds from those operators return to Winnipeg rather than stay in the community. Both however may rely on some form of food conditioning of bears, and it’s hard to escape the conclusion that bear viewing is rarely without impact to wildlife or ecosystems. I am sharing these pictures in the hope that they might increase appreciation of the need to protect such magnificent creatures. Yet there is a dilemma: it's important that a passion for wildlife is encouraged so that people lobby for their protection, and press for action to be taken on climate change. Yet, tourism has an impact on the animals' welfare, and the capacity of such an area to absorb increasing demand as economic development makes travel more affordable is limited. Much though I love observing these animals, in an ideal world they would surely be better off without any tourism. Hi Jeremy, came across your blog. Lots of great observations and sharing (and photos of course!) about your experiences in Churchill. I just wanted to correct some misinformation. Specifically three things: 1) Not every tundra vehicle in Churchill is a Tundra Buggy. There is only one Tundra Buggy company. Tundra Buggy is a trademarked name, not a generic term for all of the tundra vehicles operating in Churchill. Lots of people make this mistake. Tundra Buggies were the first to offer this kind of tourism, the other companies operating tundra vehicles came later and are not Tundra Buggies. One company operates Polar Rovers and the other Arctic Crawlers. 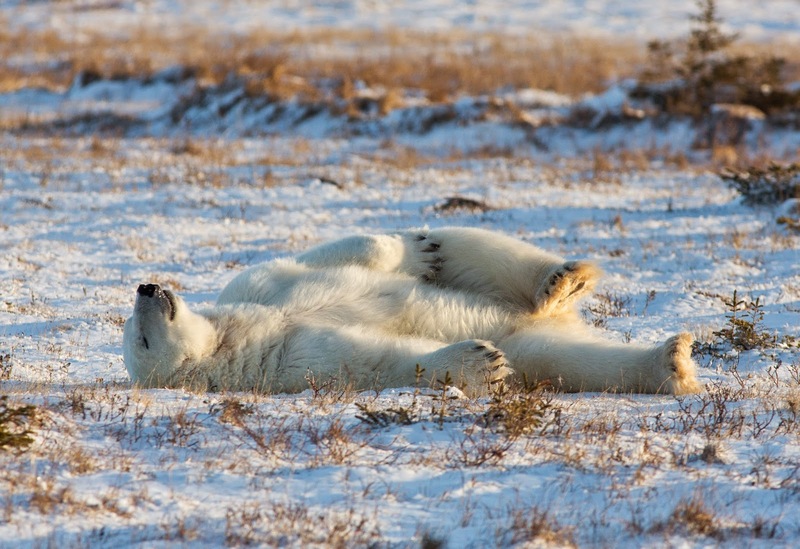 Polar Rovers have similar (though not identical) access to polar bear viewing areas as Tundra Buggies. 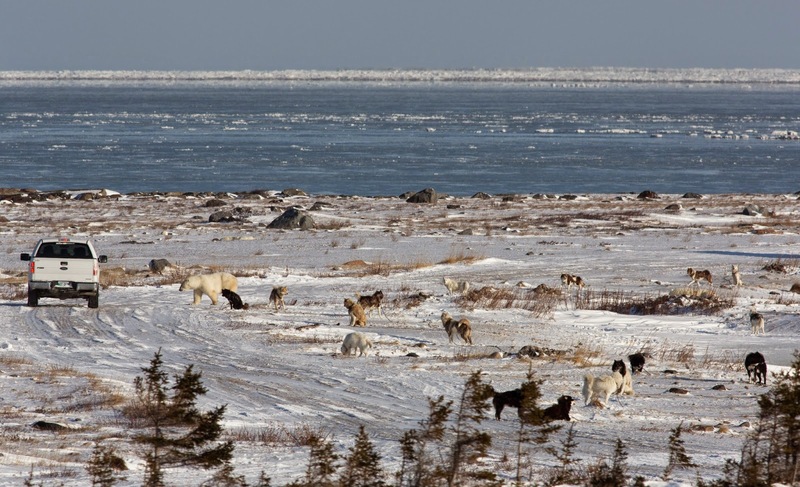 Arctic Crawlers do not have permits to access the trail network in the Wildlife Management Area and only Tundra Buggies are permitted to access the trails at Cape Churchill in Wapusk National Park. 2) Significant funds from Tundra Buggy tours actually stay in the community of Churchill. The company invests in the community in the form of property taxes, business taxes, bursaries for high school students, sponsorship of community events, providing meaningful employment for locals year-round and not just seasonally and investing marketing dollars to attract visitors from around the world who spend money in the community creating a further positive economic impact for Churchill. It's true that this is not the case for all tour operators in Churchill but it is not the case for the Tundra Buggy Company. 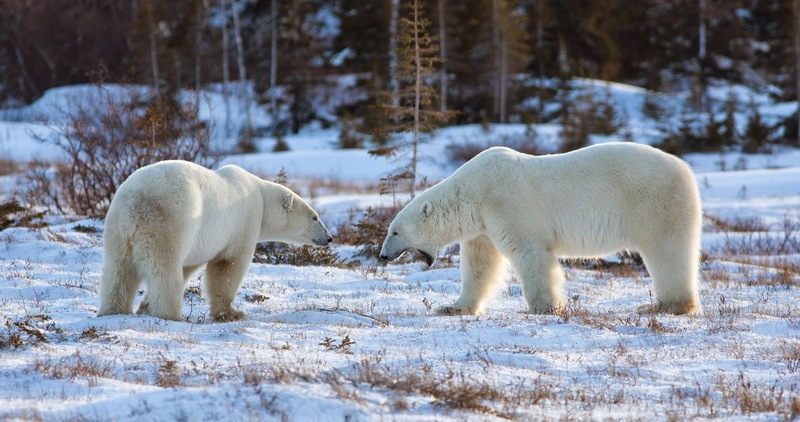 3) A study was conducted by a researcher out of the Churchill Northern Studies Centre I believe who looked at the impact of human and bear interaction via tundra vehicle. You might want to look into that study with regards to the impact of this kind of tourism on the bears. You may be surprised to learn that they found a near zero impact on bear behaviour. 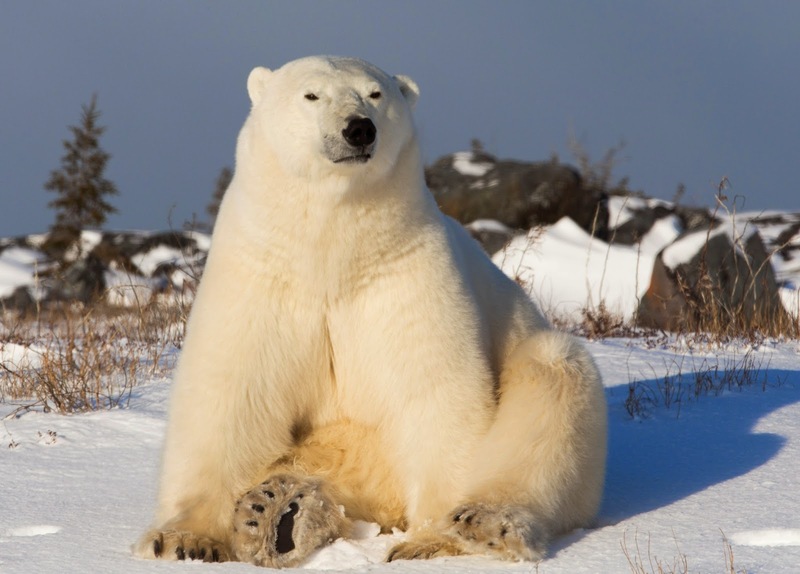 Hope that you will keep visiting Churchill and sharing its charms on your blog. It's certainly a unique place and abundant with wildlife. I didn't check but have you visited in summer? I highly recommend it! It's completely different from the autumn and there are bears around in summer too!